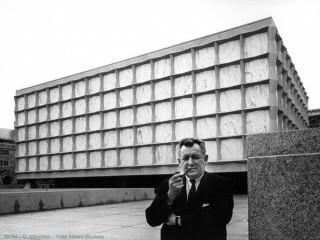 Birthplace : Buffalo, NY, U.S.
Gordon Bunshaft was an architect educated at the Massachusetts Institute of Technology. In 1988, Gordon Bunshaft nominated himself for the Pritzker Prize and eventually won it. Born in Buffalo, New York to Russian immigrant parents of a Jewish decent, where he attended Lafayette High School, an architecturally significant building, Bunshaft was a modernist whose early influences included Mies van der Rohe and Le Corbusier. His best-known design is the Lever House, built as a corporate headquarters for the soap company Lever Brothers. His design for the Manufacturers Hanover Trust Branch Bank (1953), the first post-war 'transparent' bank on the east coast, is a modernist gem. Bunshaft worked with Edward Durell Stone, worked three months for industrial designer Raymond Loewy, whom he considered a phony, and eventually became a partner in the New York office of the young firm Skidmore, Owings and Merrill. Bunshaft's only single-family residence is the 2300 square foot (210 m²) Travertine House, built for his own family. On his death he left the house to MoMA, which sold it to Martha Stewart in 1995. Her extensive remodelling stalled amid an acrimonious planning dispute with a neighbour, and when she sold the house to textile magnate Donald Maharam in 2005 he described the house as "decrepit and largely beyond repair" and demolished it. "In 1928, I entered the MIT School of Architecture and started my architectural trip. Today, 60 years later, I've been given the Pritzker Architecture Prize for which I thank the Pritzker family and the distinguished members of the selection committee for honoring me with this prestigious award. It is the capstone of my life in architecture. That's it." View the full website biography of Gordon Bunshaft.